The first thing a Java developer notices in a Scala program is the keyword object in place of class. This is because Scala is more object-oriented than Java and there is no way to define a static member in Scala. Therefore, you need to have an object with the non-static main function as defined in the above example to run a Scala program. However, nothing prevents you from defining your own class. Scala supports all the data types available in Java. Remember that everything is Object in Scala. Therefore there is no primitive equivalent in Scala; instead Scala provides basic data types equivalent to Java wrapper classes. String java.lang.String val data: String = "Bob"
Java uses the final keyword to define constant variables. In Scala, the val is used to define constant values as shown below. If you want to reassign a variable later in the code, use var to define the variable. var name: String = "Bob"
The data type in a variable definition is optional. You can rewrite the above code as given below without specifying the variable type. Similar to Java, Scala supports For loop, While loop and Do-While loop. Among them, only the syntax of For loop differs from the syntax of Java. Compare the following Java code to print numbers 0 to 9 with the Scala code given underneath. The arrow operator in the lambda expression is different from Java. The functional programming concept is quite similar in both languages but Scala code looks more native to functional programming. The Tuple is a Scala-specific data type to represent a fixed number of elements. Like most other data types in Scala, Tuples are immutable. The following example defines a Tuple with two elements: String and Int. The syntax of defining and accessing an Array in Scala is different from Java. The following Java code creates an integer array, prints the first element and then print all the elements using a for-each loop. The same logic is written in the following Scala code. Notice the parenthesis in place of square brackets when accessing an array element in Scala. The syntax of the for-each loop also differs from Java. Filling a String template with variables is frequently required for formatted output. In Java, you can do this using either the String.format method or using System.out.format method. val output = s"$name is $age years old"
I stop here as of now. However, whenever I use a new Scala feature in my series of Apache Spark article, I will describe them here. The official Scala Documentation is another good resource to learn Scala. As I have mentioned earlier, this article is not a complete Scala cookbook. 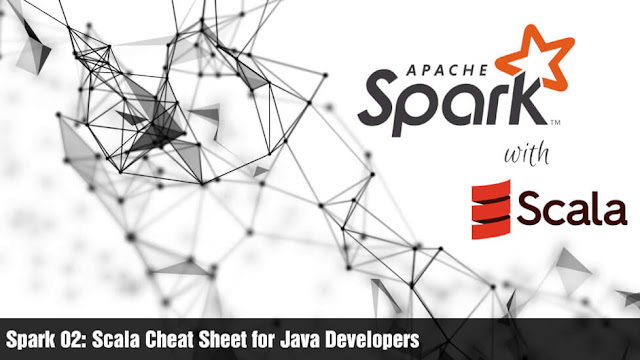 It is only a cheat sheet for my Apache Spark articles.